In recent months I have realized that my use of sequent occupancy to review disease history for a place appears to be popular. The reaction to such a theory is opposite of the reactions I received from some of the audience when I presented it as a part of my thesis back in August of 2000. The concerns being expressed about my attempts to revive this geographic concept popular up until the late 1960s was that it still had some of the negative history once attached to it still in the minds of the professors attending my defense. In spite of this resistance to the idea, I find sequent occupancy to still be an effective way to review disease history for an area, and attempt to develop a more accurate understanding of the disease history at hand. The exact term “sequent occupance” is said to have been coined by Derwent Whittlesey by the publication of an article with this as its title in 1927. According to Whittlesey himself, this term had been developing as a result of conversations between himself and his colleagues for quite some time. In some of the earliest annals published as a product of the American Association of Geographers, a number of writers elude to this concept, beginning with some of the earliest of these ideas propagated by some of the oldest members of the Association during these years, school teachers and college professors who helped form the classroom experience with geography in the years after the Civil War. But like many ideas, there isn’t an exact beginning for the sequent occupancy definition. The actual term itself, with a modern “modern” meaning assigned to it for the time it was created by Whittlesey, had its positive and negatives in terms of social meaning, cultural value, American pride, and during more recent decades, social and political correctness. Sequent occupance was a term that developed during one of those “dark ages” in geographical and scientific teachings. The Second World war was still about 15 years away when Whittlesey published this philosophy. It was about a decade since the first World War was over. The arguments between church and science of the very early 1900s were no longer that common, and the controversies regarding scientific and medical teachings had seemingly reach an short lull in the battlefields, enabling the field of eugenics to begin to express itself in the form of a title found on the thick textbooks of science. We were now just halfway between the birth of eugenics thinking and the dawn of a new version of eugenics to result in the Second World War, those thoughts of the famous German leader Adolph Hitler. We often equate the word eugenics with the morally and socially bad utopian philosophy Hitler developed in order to create his first act of defiance against the world. But some of this negative part of world did come about due to philosophies that arose from the sequent occupance theory, ideas like natural and social selection (natural and social or neo-darwinism) going hand in hand and the notion that determinism played an important role in the whatever changes a society was most likely to go through as it developed in size, technological prowess, income and manners of living in the rapidly growing urban setting so much in need of its food and natural resource sources–the rural hinterlands, borderlands and their own forms of evolving communities. This interpretation of the impact of the idea “sequent occupance” on a society is just one way of interpreting people, places and their ways of interacting and using the land. Like I said before elsewhere, this is a natural part of human behavior, one that is the result of our own ethnocentricity about ourselves whenever we think, speak and write in this manner. More than a century before Whittlesey wrote his “Sequent Occupance” essay, a similar philosophy was penned and shared with the British Elite by the famous Philadelphia physician and signer of the Declaration of Independence Benjamin Rush. For which see . . . . In terms of personality and character, Dr. Rush was still very much British in his ways of thinking, but strongly devoted to his own beliefs and philosophies when it came to his observations and speculative writings about people, human behavior, living practices, and health. At any point of time in his life, Dr. Rush could be perceived to be arrogant and self centered, seeming as though he were placing himself above some Higher Power. When yellow fever came to town, Dr. Rush believed he knew its cause–decaying coffee grounds in the harbor dumped off of ships was one such theory of his after the 1793 epidemic. The need for Indian culture to evaporate away in exchange for becoming more civilized was another of his philosophies. When it came to the “behaviorally challenged”, or should I say the psychological needy and most manic or depressed of Americans, Rush felt he was very much a very good sympathizer when it came to understanding their illnesses. In the least, Dr. Rush at least understood the irregularities of human behavior that he was witnessing in the United States during its first decades of solitude from the British patriarchy. Rush’s sequent occupance refered to people’s periods of social development as more an example of how society must evolve financially and behaviorally so as to service the needs of the urban residents where governments formed and engaged in their daily practices, and where the financial leaders held their grounds as founders and builders of the new civilizations being developed. Another way to understand disease change is to look at the changes in disease theory. Disease theory is based upon theoretical cause for disease. As that theory for cause changes, the sequences of disease changes, the relationships of disease patterns to each other are treated differently. In Dr. Cornelius Osborn’s ca. 1760 vade mecum (recipe book with theory) that I evaluated 20 to 30 years ago, I noticed that Osborn believed that what are today unrelated, appeared related to him, like the edema of the body leading to intestinal problems, then ascites and then peripleural effusion and finally cardiac problems due to infection of the pericardium. The worst form of wrongful flow of fluids (and perhaps “ens”, entia or energy) through the body led to a filling of the lung and “consumption” (tuberculosis). When the most accepted theory for tuberculosis changes, the philosophical reason you caught it had to change as well. By 1850, we see a maturation of the medical climatology and topography theories. In an article by British physician Richard Haughton, his review of the changes in disease patterns in England elude to the changing hypotheses for disease, as her refers to “antiphlogistic medicine”, a use of the mid 18th century phlogistic theory, recomposed using the “new science.”. So when Whittlesey perfected the sequent occupance model in the late 1800s, he had the predecessors’ teachings impacting much of his interpretation of place over time. Sequent occupance was tested for its utility, but mostly be landuse researchers trying to define economic or occupation related changes in the purpose of a place over time. 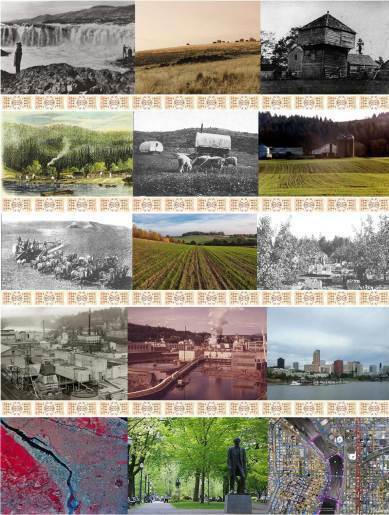 As the forests fell, new fields were raised, or young forests replanted for other industries. The older growth forest was replaced by faster growing paper pulp trees, on occasion. But more often than not, by orchards, nut farms and the like, and other land uses that were like older farming by more of a new industrial form of this common business. The subsequent sequent occupance models published or discussed, almost always focused on economic geography. Yet attached to industry, business, the related ways of living are the diseases. This aspect of sequent occupance was left untouched. During the 1960s into the 1970s, the sequent occupancy philosophy underwent a shift from its focus on certain standard ways people lived in a place over time, to a way of interpreting a particular place’s civilization or series of populations in a more anthropological fashion. For this reason, sociologists and anthropologists made good use of this theory to back their studies and findings concerning other, non-United States and non-Western European cultures. University scholars used it to define the types of behavior and living practices we found in parts of South America, certain indigenous settings, and even back woods countryside residential settings. But these attempts to maintain this philosophy lost much of their momentum by the end of the 1970s, leaving us with a decade of non-sequential occupants thinking that enabled other potential avenues to be taken by sociologists and the like. The 1990s might be referred to as the post-modern era, due to its attraction to retrospective views, its pseudo-anti-technological behaviors and attitudes, and the very proactive people came when it came to that old pro-United States, ethnocentric point of view once known as patriotism and nationalism. Unknowingly, these behaviors were making it easier for the older concept of sequent occupancy to be brought back into the limelight. Post-modernism added that fifth era to the sequential occupancy chronological scheme, taking us out of the modern, high technology era that replaced the earlier industrial era, which in turn superceded the farming/agriculture, farms and settlements, and wilderness periods of regional population development. With the return of followers of the sequent occupancy tradition, we have applications for this philosophy that apply to researchers, writers and teachers of the old school thinking, like the teachers trying to put sequent occupancy into perspective to children in middle school. Urban developers take advantage of the self recognition that the post-modern stage has resulted in for their teachings. Sociologists, cultural anthropologists, and human geographers benefit from this teaching due to its more inclusive, multiethnic way of presenting ourselves. Then there are those few readers out there considering my historical medical geography perspective as a more applicable way of interpreting our medical past, presence and future. The James Way is a page I posted of a single site I first saw as a child, and later revisited for the first time in decades around 2010. Upon touring the property, now up for sale, I could see at least two clearly defined sequent occupancy stages demonstrated by the architecture of its Turkey Barns and Coops. I first made full use of sequent occupancy thinking when I review this old turkey farm. I remember it as a kid. Farms were then still abundant in the valley and it was not unusual to drive by them, and see and hear dozens of horse and cattle, sheeps and pigs, hundreds of chickens, surrounded by numerous flocks, herds of small animals. On this street in the woods heading towards PinePlains, there was this coop I recall that was filled with a hundred or more pigeons trained in local mail service. On the street heading up Academy Hill, was the large Turkey Farm. That was the 1960s. Uses for these lands have now changed. Where there were farms there are now housing developments. Where horses and cattle wandered the fields, large white fences now line the boundaries of this land being used to train race horses. It used to be you’d go to the corner deli and see a half dozen hunters and fishermen passing through. Now you fellow consumer is wearing a fancy equestrian uniform, is dressed for equestrian training of the weekends polo game, or ready to go out on ready made pre-planned fox hunt. In the non-recreational building setting you had large industries being built, along with warehouses and office buildings. One by one, those large barns you would drive by every day, that smell of the swine everyone loved on their way to school by bus, all disappeared by the time you were attending high school. Those large barnstores families no longer offered their eggs, cheese, milk, cider, fruit and vegetables for sale on nearly every dirt road and driveway heading into the fields and abode. Many of these necessities to local life went away, as the region quickly became modernized. This is what the old Turkey Farm reminded me of every time I drove by it during my days as a west nile field scout and epidemiologist. This one place I came upon while doing this work led me to recall the days it was a fully active, loud and annoying coopery, with lights on at all hours of the day it seemed. Even as a child I had no idea what the type of coop it was, but I could see the birds that were bred from afar. So while walking around viewing this old setting, I recalled our drives home from my aunt and uncle’s place of stay in the back woods there, as a kid less than 6 or 7 years of age. It ended up, after an hour of wandering these grounds, documenting everything I saw in pictures, that I was able to pull together a story about this place and determine that it was for raising white Holland Turkeys, a part of the local Dutch heritage still alive back in the 1950s and 1960s, but failing to thrive during the 1970s. The structures at this place revealed much to me about the sequent occupancy features of this place, and so I decided to cover its history in this way. The following disease chronology for this kind of place was then drawn up. 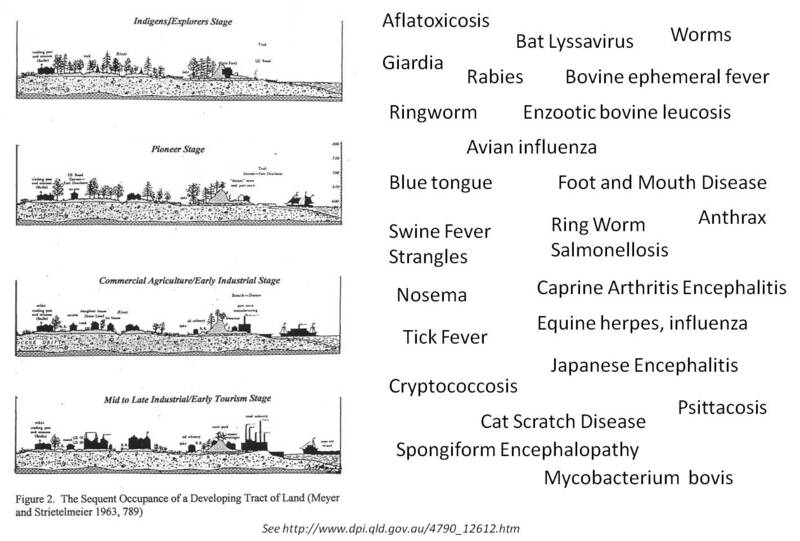 In the livestock indiustry, emerging animal diseases is always a hot topic, although to the very few at times. This sequent occupany ideology came to me during my thesis writing year in Oregon. I came upon it while reading through the classics found in the Annals of the American Association of Geographers. This way of viewing places, living practices and culture I felt had a relationship to the way we could interpret a place historically in terms of its disease patterns. The problem I was then having with my thesis is what led me to this search for more information on analyzing the history of health. After a year of analyzing cholera migration along the Oregon trail, I was still left with the dilemma of not knowing what the “cholera” that hit Oregon in 1852 actually was, after all it hit in the winter, a time when it is impossible for asiatic cholera to still be active in the local environment and stagnant water bodies. By reviewing places and their changes over time, with regard to the place itself, the animals that occupy it, and finally the people, you get an idea just how the make up of a place can efffects the kinds of diseases that are going to strike. For my thesis, I argued that Asiatic cholera required popualtion density, and the other cholera, any of several severe forms of diarrhea and dysentery, were due to several environmental features responsible for animal deaths, the contaminated carcasses of such gave birth to the bacteria that caused so much diarrhea in 1852 and 1853 along the Oregon Trail. That is where my most commonly used rendering of sequent occupancy at this site was derived.